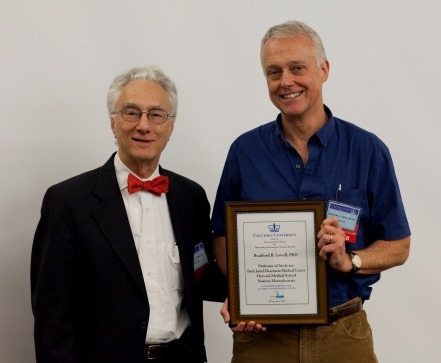 The award was presented to Dr. Lowell during the Frontiers in Diabetes Research Symposium on November 18, in a ceremony held in the Russ Berrie Medical Science Pavilion at Columbia University Medical Center (CUMC). The Naomi Berrie Award for Outstanding Achievement is Columbia University’s top honor for excellence in diabetes research. Dr. Lowell is the 19th winner since the award’s inception in 1999. Dr. Lowell and his team were among the first to establish the role of brown fat—which is abundant in newborns and burns stored energy as heat—in the regulation of body weight. In a Nature paper published in 1993, they reported on the development of a new method to study brown fat, which is difficult to investigate surgically. Dr. Lowell’s team engineered mice to have a deficiency in brown fat and showed that these mice become obese. In special lines of mice designed to regenerate the brown fat, obesity disappeared. Harnessing technical advances in genetics and neuroscience to study the brain’s complex circuitry in real time, Dr. Lowell has also examined the neural basis of hunger. In one study, Dr. Lowell’s group used optogenetics—a method that enables genes to be switched on or off using a light source—to chart how a key gene called MC4R regulates appetite in the mammalian brain. Using this technique to switch on MC4R neurons, the researchers found that they could make transgenic mice lose their appetite. Dr. Lowell is currently using a new precision gene-editing technique called CRISPR to create lines of mice that can express specific genes in a controlled subset of neurons. These lines will allow scientists to determine which behaviors the neurons control and ultimately map in greater detail the neural connections that control hunger and compel eating. Dr. Lowell received his MD and PhD from Boston University’s School of Medicine, completed his bachelor’s degree in physiological psychology at the University of Massachusetts, Amherst, and has published nearly 200 scientific papers. The Naomi Berrie Award for Outstanding Achievement in Diabetes Research was established by the Russell Berrie Foundation in 1999. The award promotes and rewards outstanding achievement in the field, while at the same time supporting the careers of promising young diabetes investigators. Each year, the recipient—a senior scientist outside of Columbia who has made major contributions to diabetes research—is given $130,000 to support a two-year research fellowship for a student or research fellow in his or her laboratory. The Russell Berrie Foundation program also includes an award for junior-level investigators, who are designated “Berrie Fellows in Diabetes Research.” Columbia has awarded the 2017 Berrie Fellowships to Amelia M. Douglass, PhD and Junjie Yu, PhD. Dr. Douglass received her PhD from the Max Planck Institute of Neurobiology in Munich, Germany, and a bachelor’s degree in developmental neurobiology from the University of Queensland in Brisbane, Australia. In the Lowell Lab, Dr. Douglas will use optogenetics, chemogenetics, cell-specific neuron-mapping techniques, and in vivo calcium-based imaging to understand the neuronal feedback and feedforward circuits associated with hunger. Dr. Yu completed her PhD at the Institute for Nutritional Sciences, Chinese Academy of Sciences, China, and a bachelor’s degree in biological sciences at Shandong Normal University, China. Working in the lab of Utpal Pajvani, MD, PhD, Dr. Yu investigates how inhibiting components of the Notch signaling pathway can simultaneously improve obesity-induced type 2 diabetes and a liver disease called nonalcoholic steatohepatitis (NASH). Mohsen Khosravi Maharlooei, MD, is the Russell Berrie Foundation Scholar for 2017. This award of $75,000 provides support for international scientists to work at the Naomi Berrie Diabetes Center in collaboration with Columbia scientists. Dr. Maharlooei completed his medical degree at the Shiraz University of Medical Sciences, Iran, and holds a master’s degree in experimental medicine from the University of British Columbia in Canada. Dr. Maharlooei will be working in the lab of Megan Sykes, MD, to study the diabetogenicity of different types of insulin-specific T-cell receptors.